Politics can be an ugly business. Health-care politics, especially so. Health-care companies that get mixed up in politics? That was $28 billion worth of ugly on Tuesday, and the stock market damage continued on Wednesday. The slide began in earnest on Tuesday when UnitedHealth Group Inc. -- treated by investors as a bellwether for the insurance sector -- waded into the debate over “Medicare for All,” which would expand government-administered coverage to most of the population and rewrite the businesses of U.S. health insurers, hospitals and doctors. The slide in hospital and insurance stocks continued Wednesday, wiping out billions of dollars more in market value from some of the biggest health companies in the U.S. UnitedHealth fell 3.2 percent at 2:20 p.m. in New York. Its competitor Anthem Inc. was down 6.8 percent, and Cigna Corp. slid 5.1 percent. Hospital chain HCA Healthcare Inc. dropped 3 percent, and Community Health Systems Inc. lost 5.5 percent. The rout has started to bleed into the broader space, hitting medical devices, biotech and pharmaceutical shares. 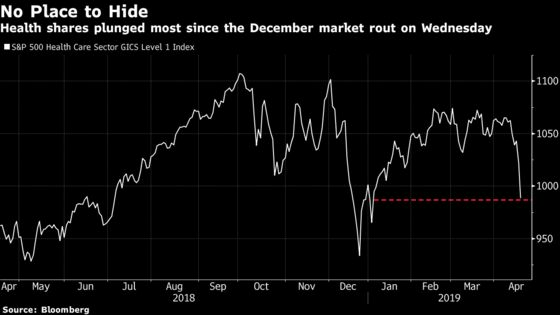 The S&P 500 Health Care Equipment Index plunged 4.3 percent, the most since February, while the Nasdaq Biotech Index fell 4.5 percent. Among drugmakers, Allergan Plc declined 5.4 percent, Pfizer Inc. was down 3.6 percent and Merck & Co. fell 4 percent. For months, health insurers have kept largely out of the fray over the proposal to expand Medicare, the government program that covers about 60 million mostly elderly Americans. As UnitedHealth’s chief executive officer began to wrap his remarks Tuesday morning during the company’s call with analysts, that changed. The proposal would be a “wholesale disruption of American health care,” and would “surely have a severe impact on the economy and jobs -- all without fundamentally increasing access to care,” CEO Dave Wichmann said on the call. As a source of coverage, UnitedHealth is almost as large as Medicare itself. It provides health-insurance services to 49.7 million people, and last year recorded revenue of $226.2 billion. Along with insurance, it operates physician practices, sells consulting and data services, and administers drug benefits. It also covers millions of people in private-sector versions of Medicare and Medicaid. Last week, Senator Bernie Sanders of Vermont, who is contending for the Democratic presidential nomination, discussed his support of Medicare for All at Fox News town hall in Bethlehem, Pennsylvania, on Monday night. Fox anchor Bret Baier asked the audience at the event to raise their hands if they had private health insurance from an employer. A spokesman for the company said UnitedHealth has long supported the expansion of health-care coverage.